The only thing wrong with this universe are suppressives who specialize in caving people in. They walk among us undetected, hiding behind masks of social veneer. And those masks are more convincing than the best special effects in a Hollywood film. But there is a tech to shatter the facade, and so reveal, in vivid detail, the true face of suppression. And that tech puts you at total cause. Because while SPs are vicious, they are also cowards. And like all creatures of darkness, they cannot stand the light of exposure. This is the tech that allows you to understand all behavior and fathom everyone you meet—the good and the bad. Never again will you be deceived by concealed identities behind the masks—masks that suddenly become as obvious as a child’s Halloween costume. Here is the most vital technology to your future as a being. Because the only thing that can ever stop you, in any part of life, is suppression. And once you know the tech of suppressives, you are impervious to their power. Forever. 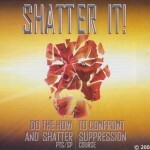 Do the How to Confront and Shatter Suppression Course. Come to Flag retreat and enroll—just START! The complete mechanics of how the suppressive weaves this web while hiding behind a facade. Ability to look at people and really know them— who your friends are and who your friends aren’t. The technical handlings to handle suppression and never go effect of it. HUNDREDS OF GRADUATES WERE ASKED WHAT THEY WANTED YOU TO KNOW ABOUT THIS COURSE. 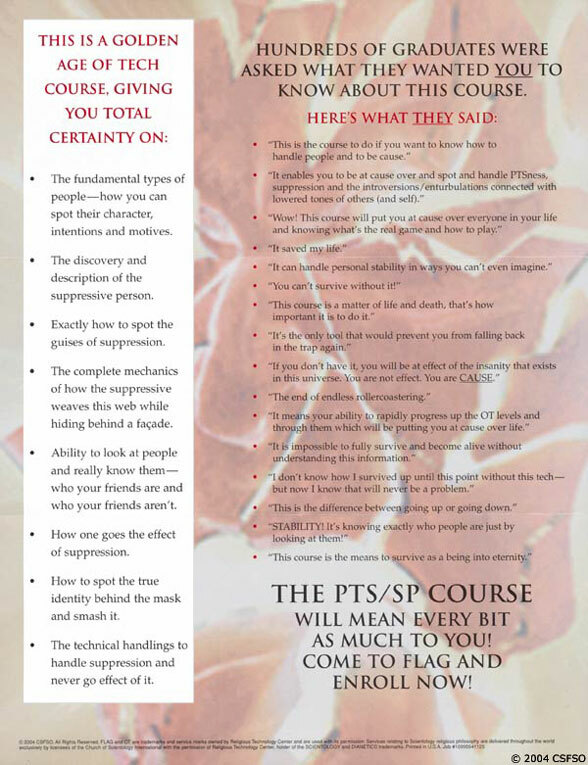 THE PTS/SP COURSE WILL MEAN EVERY BIT AS MUCH TO YOU! COME TO FLAG AND ENROLL NOW! Shatter Suppression! (2004). [Advertisement]. Church of Scientology Flag Service Organization. 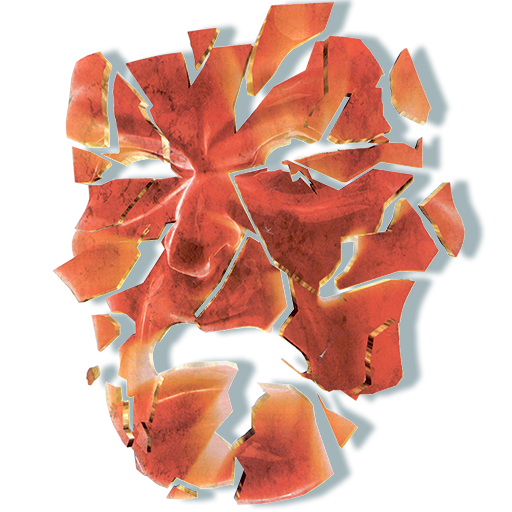 This Flag promo piece for the How To Confront and Shatter Suppression Course illustrates the SP as a fiend or devil that Hubbard’s tech shatters. Scientology provides a long list of Suppressive Acts that make one an SP, some of which are provided in this Questionnaire. If you answer “Yes” to any of the following questions, by Scientology’s “scriptures” you are guilty of a Suppressive Act, and you are an SP. For your protection and the protection of anyone to whom you are connected or with whom you deal you should contact the Suppressive Persons Defense League (SPDL)®. Have you ever used the trademarks and service marks of Dianetics and Scientology without express permission or license from religious Technology Center or its authorized licensee? Have you ever used the materials of Dianetics and Scientology without authorization? Have you ever held, used, copied, printed or published confidential materials of Dianetics and Scientology without express permission or license from the author of the materials or his authorized licensee? Have you ever publicly disavowed Scientology or Scientologists in good standing with Scientology organizations? Have you ever made public statements against Scientology or Scientologists? Have you ever pronounced Scientologists guilty of the practice of standard Scientology? Have you ever testified hostilely before state or public inquiries into Scientology? Have you ever reported or threatened to report Scientology or Scientologists to civil authorities? Have you ever brought civil suit against any Scientology organization or Scientologist, including the nonpayment of bills or failure to refund? Have you ever demanded the return of any or all fees paid for training or processing actually received or received in part and still available but undelivered? Have you ever written anti-Scientology letters to the press or given anti-Scientology or anti-Scientologist data to the press? Have you ever continued membership in a divergent group? Have you ever continued adherence to a person or group pronounced a suppressive person or group? Have you ever failed to handle or disavow and disconnect from a person demonstrably guilty of suppressive acts? Have you ever been at the hire of anti-Scientology groups or persons? Have you ever acted in any way calculated to lose the technology of Dianetics and Scientology to use or impede its use or shorten its materials or its application? Have you ever engaged in musical chairs? Have you ever withheld vital information? Have you ever secretly planned to leave and made private preparations to do so without informing the proper terminals in an organization and did leave (blow) and did not return within a reasonable length of time? Have you ever invalidated Clears or spread [the truth] about the behavior of Clears? Have you ever publicly departed Scientology? Have you ever diverted funds and business from an organization to its detriment? Have you ever permitted suppressive and PTS people in Publications Organizations or departments or in advertising? Have you ever fed the Clear cognition to any individual? Have you ever evaluated for a preclear about the Clear cognition or coaxed him to any cognition? Have you ever fed a person the end phenomena of the Hubbard Key to Life Section 2B Clay Table Process? Have you ever dealt with a declared Suppressive Person? Have you ever maintained a line with, offered support to, or in any way granted credence to a Suppressive Person? Suppressive Persons comprise a racial and religious minority persecuted by the Scientology cult. The Suppressive Persons Defense League (SPDL) ® unites SPs, defends SPs against beastification, attack and menace, and brings SPs to stand up against the Scientologists who seek their obliteration. Additionally, any person who deals with, or merely grants credence to anyone who either has or does not have Scientology’s “ correct technology” is also guilty of one of the cult’s High Crimes, also declared an SP, and also slated for disposal. 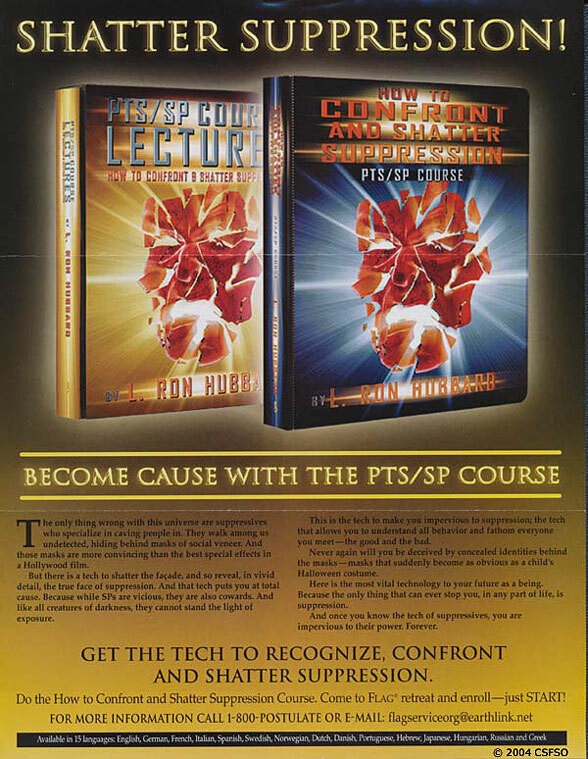 Scientology’s “correct technology,” it must be said, includes the quiet, sorrowless disposal of its invented enemies – the SPs – which includes those who would make a public statement against their own obliteration. The SPDL asks every SP, every person who answers “ Yes” to any of the questions above, to stand up, be counted and be targeted. Unite with your fellow SPs, and unite with the SPDL to expose, elucidate and eliminate the antisocial and deadly SP Doctrine. Stop planetary clearing while we still can. The SPDL calls on Scientology to forsake the Suppressive Person Doctrine, and we call on Scientologists, if their cult will not forsake this pernicious doctrine, to immediately forsake Scientology.